#7 Nebraska picked up a road win in Columbus against Ohio State Wednesday night. The Huskers hit .407 in the match and ran away with the third and fourth sets after the Buckeyes stole the second set. 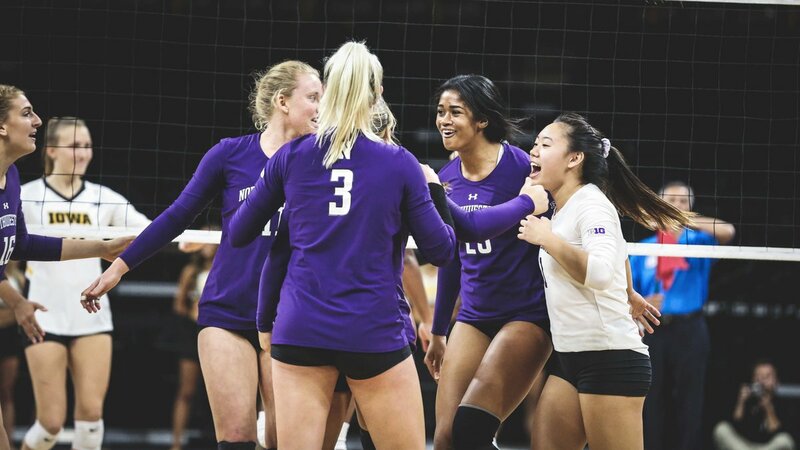 In Champaign, #5 Illinois took care of business against Maryland, but the match of the night saw Northwestern stun (RV) Iowa in five sets on the road to win just its second Big Ten match of the season. Northwestern was led by outside hitter Nia Robinson, who tallied a career-high 26 kills and hit .370. Robinson had help as middle hitter Alana Walker added 15 kills and hit .636. Outside hitters Abryanna Cannon and Ella Grbac both chipped in 12 kills. Outside hitter Cali Hoye led the Hawkeyes with a match-high 30 kills in 69 swings. Ride side hitter Reghan Coyle added 17 kills for Iowa. Both setters were busy, as Northwestern’s Britt Bommer registered 69 assists and Iowa’s Brie Orr had 56. Northwestern hit .321 for the match while Iowa hit .238. Northwestern started out strong in the opening set. The Wildcats opened a 12-5 lead early and never looked back. Northwestern closed out the set on a 6-1 run to take the 25-15 win. The Wildcats were in good position to take the second set as well, as they led 12-8 early on. But Iowa rallied and tied the set at 19 apiece. From there it was back and forth. Both teams saved multiple set points before Iowa finally took the set, 32-30. Northwestern blitzed Iowa to start the third set as the Wildcats jumped in front 9-1. Iowa cut the lead to four at 22-18, but Northwestern won the final three points and the set, 25-18. S3 | Abryanna Cannon extends the #B1GCats lead back to seven points with her sixth kill of the night! Iowa used a 4-0 spurt midway through the fourth set to take a 13-7 lead. The Wildcats trimmed the lead to three at 20-17, but a 5-0 surge by the Hawkeyes send the match into a fifth set with a 25-17 win. With the score tied 6-6 in the fifth, Northwestern seized control of the match with a 5-0 run. Iowa managed just two more points before the Wildcats closed out the match, 15-8. Middle blocker Lauren Stivrins led four Huskers with double digits kills. Stirvrins tallied a match-high 16 and hit .789, outside hitter Mikaela Foecke notched 12 kills and 11 digs, outside hitter Jazz Sweet added 11, and outside hitter Lexi Sun registered 10 kills and 10 digs. Ohio State was led by opposite hitter Vanja Bukilic‘s 11 kills. Outside hitter Bia Franklin added 10 kills for the Buckeyes. Both players did struggle on the attack, as Bukilic hit .091 and Franklin managed just .050. The Huskers were extremely efficient on the attack, tallying .481 in the first set, .390 in the second, .480 in the third, and .600 in set four. Nebraska finished at .407 for the match while holding Ohio State to .083. Illinois got 12 kills apiece from outside hitters, Jacqueline Quade and Megan Cooney. Quade also led the team defensively with 14 digs. The Terrapins got a team-high 9 kills and 9 digs from outside hitter Erika Pritchard. The Illini hit .333 as a team and held Maryland to .055. Illinois held a more than 2-1 advantage in kills (51-25), committed 6 less errors (19-13), held the advantage in blocks (4-1), and aces (4-1). The Illini improve to 8-2 at Huff Hall this season. #7 Nebraska hosts #5 Illinois at 8 p.m. ET Saturday. Maryland welcomes (RV) Iowa at 1 p.m. ET Sunday. Northwestern takes on Ohio State at 2 p.m. ET Sunday.